Car Booth Sale: The Sportsfield Development Committee will hold a Car Booth Sale on Saturday, May 26th, at the Old Creamery Yard between O’Rourkes Cross and Bruree village. If you want to do a spring clean and sell items you no longer need or want you can set up a stall and sell away. Traders can set up from 8.00 am and the admission is €10 for cars or €20 for vans. The sale is open to the public from 10.00 am to 3.00 pmand admission is just €2 for adults. Children are admitted free. Tea and refreshments will be available. Senior Hurling: Our senior hurlers were outgunned by an Emmett’s side firing on all cylinders at Kilmallock on Sunday night in the first round of this year’s championship. They say goals win games and in this case that was true. Emmett’s scored three while Bruree came close on a number of occasions but could not find the net. Bruree trailed by two points at the break on a 0-6 to 1-5 scoreline. Emmett’s goal came from a penalty while Kieran O’Dea (0-2 frees), James V O’Brien (0-2) and Gerard O’Brien (0-2) provided Bruree’s scores. Within minutes of the resumption, Bruree had levelled matters, thanks to a pointed free from Kieran O’Dea and a point from play from Tommy O’Brien. Emmett’s regained the advantage with a scrambled goal and a point to leave Bruree with an uphill struggle. Midway through the half, a great run from Tommy O’Brien set up Michael lane for a Bruree goal which along with an earlier Kieran O’Dea pointed free levelled matters. But that was as close as Bruree got to victory. Scores came more easily to the South combination and they ran up three points before they again found the Bruree net with a few minutes to go. Pointed frees from Kieran O’Dea and a final Emmett’s point left the final score Bruree 1-11 Emmetts 3-10. This leaves Bruree with a difficult task again this year and they will be fighting to progress in the championship. 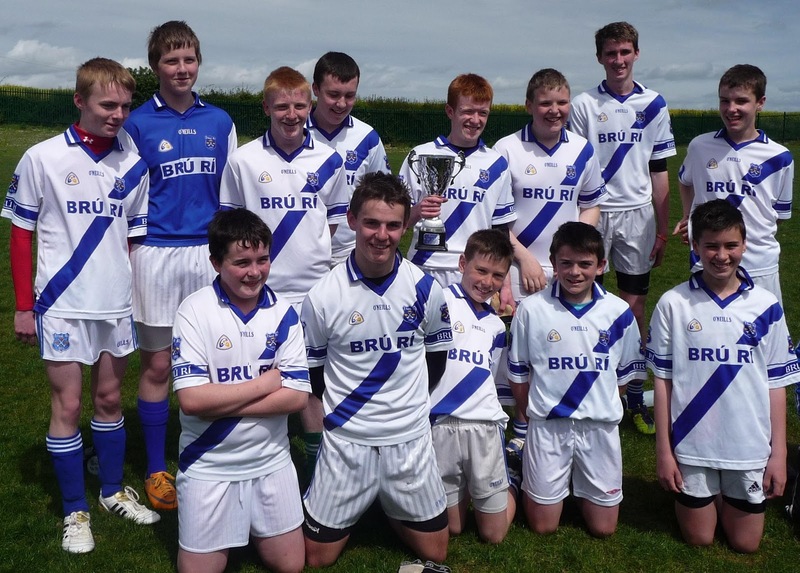 The Bruree team was Eamon Sexton, Kieran O’Rourke, John O’Brien, John P Murphy, Dessie Linehan, Shaun O’Riordan, Shane Mullane, Andrew Sexton, Gerard O’Brien Kieran O’Dea, Gerard O’Dea, Tommy O’Brien, David Hogan, James V. O’Brien, Michael Lane, Stephen O’Halloran, Vincent Stanton. Golf Classic: Bruree GAA in conjunction with Bruree Golf Society will hold a Golf Classic at Charleville Golf Club on Friday, June 1st next. This will be the club’s main fundraising event for 2012 and it is hoped that the event will generate the funding required to maintain club services to an appropriate standard. Bruree National School’s girls chess team finished 7th in the All-Ireland Chess Finals held in the Castletroy Park Hotel last week. Congratulations to all involved. The team was Julianne Barrington, Grainne Monaghan, Grace Donworth and Emma Howard. Our Under 14s bounced back from their recent disappointment with the big ball by recording two big wins. First up were Fedamore and the team settled to the task from the throw-in scoring freely with Sean Quirke scorer in chief on the night. Others to shine on the night were Cathal Barrington, Daire O’Driscoll, Gearoid McCarthy and David O’Connell. Next up were Blackrock two nights later and again we started brightly with the midfield of Daire O’Driscoll and Jimmy Leslie-Madigan ensuring a good supply of ball to the forwards. Tommy Cronolly was in sparkling form contributing handsomely to the scoreline. Brian McCarthy made a great contribution when introduced and Shane Hannon showed some nice touches. Ed Moore was the standout player in defence on the night – you must be learning something from the Tipp lads! The management took the opportunity to make a number of changes and it is great to see real competition for places on the team. Bruree’s Under 16 footballers went down to the narrowest of defeats against Castletown/Ballyagran in Bruree. Bruree were six points down at half time but fought back well in the second half and in the end were very unlucky not to have at least drawn the game. After months of preparation our Under 11 tag rugby team were well ready for the first round of the tournament held in Mungret earlier this week. The top two teams to go forward to the next round and the results will be announced next week. Well, it’s that time of year again; it always seems to signal the beginning of summer, the Community games sports night held every year in the school field. Due to the unseasonable weather at present the date for the night will be announced through the school. It is hoped to hold it in mid May at 6.00 pm. The events held on the night cater for all ages, from the Under 5’s up to Under 16’s. First, second and third placed competitors who qualify will go on to represent Bruree/Rockhill in the county finals. We will have relay racing, track racing, long puck and a number of new novelty races - egg and spoon, bean bag, sack race and a family relay. So come on everyone get those runners on and show us what you are made of. This year it was decided to enter a new event, a 2km bike race on grass (Under 12 and Under 14 eligible to enter). Anyone interested can contact Mrs. McSweeney through the school. Competitors must have their own bikes and helmets are essential. Lucky dip winners in last week’s Bruree GAA/Rockhill Rovers lotto draw were €50 Mike Lyons €25 John Fitzgerald, Rockhill Cross, Kathryn and Laura Leslie €20 Mad 45rs c/o Moloneys Bar, Patrick Sexton, Martha Potter, Effin.